There is an inside joke and friendly rivalry amongst expats in Medellín. Those who live in either the El Poblado or Laureles neighborhoods rarely cross the river to go to the other neighborhood. Why you ask? It´s not because they dislike the other community. Nor is it because the trip takes a long time. The simple reason is that there is really no need to go to the other neighborhood because each area has everything you need for daily life. Both El Poblado and Laureles have shopping malls, universities, movie theaters, restaurants, coffee shops, world-class hospitals, banking, public transportation and a selection of grocery stores. What sets each of the neighborhoods apart from the other is the ambiance and vibe. Both neighborhoods have been experiencing 10% to 12% per year appreciation in real estate values. The Medellín river runs north-south through the entire Aburrá valley and acts as a natural divide between several of the city´s neighborhoods. Even though El Poblado and Laureles are the two Medellín neighborhoods where you will find the highest concentrations of expats, they only make up a small (but growing) percentage of the population. 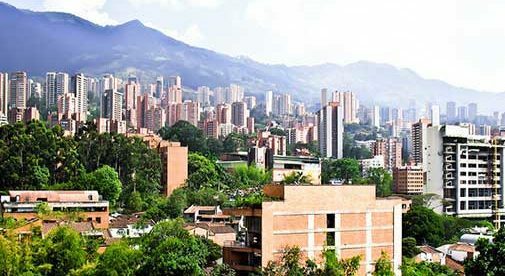 I chose El Poblado as my home, and it’s considered the most affluent neighborhoods, and one of the most sought-after areas for real estate in Medellín. Stretching out over nearly nine square miles, it is also the largest, giving you a wide choice of living options. The Castropol, Provenza and Lalinde sectors are excellent options if you want to be in the heart of the dining and entertainment zone. A short stroll from the front door of your apartment building along the lush, green, tree-lined streets brings you to rows of ethnic restaurants offering choices for every taste. Enjoy Italian, Mediterranean, Arabic, Indian, Argentina BBQ and Asian fusion dishes, as well as gourmet hamburgers and gelato for dessert. As you sit in one of the many sidewalk cafés and sip some world-famous Colombian coffee, the sounds of birds singing and the gurgling brooks which dot the areas make you forget you are living in the midst of a large city. La Calera is a sector in the uppermost reaches of El Poblado with some of the most spectacular mountain and city views. This completely residential area is filled with 20-plus-floor high-rise towers and gated high-end single home complexes. Walking up and down the steep hills around La Calera requires strong legs and good lungs, so most residents own a car. The tradeoff is spending time on your balcony, sipping an evening cocktail and watching the sun set with the city of Medellín laid out below you in all its splendor. Three-bedroom, three-bathroom apartments in buildings in the La Calera sector with amenities that include a swimming pool, 24-hour security, gymnasium, sauna, hot tub and inside parking run in the $200,000 to $400,000 range. Stand-alone homes start at $400,000 and go up. The Laureles neighborhood is a good blend of typical Colombia with a bit of the upscale. It was the most affluent neighborhood in Medellín in the 1990s and is often referred to as “El Poblado before there was El Poblado.” A striking contrast from the hills of El Poblado, Laureles is predominately flat with pedestrian-friendly streets that make walking easy. The area along Nutibara Avenue and stretching side to side from Primer Parque (first park) to Segundo Parque (second park) is the hub of the Laureles neighborhood. This sector is chock full of restaurants, shopping and entertainment. While you can find cute cafés everywhere in the city of Medellín, the neighborhood of Laureles seems to have attracted a huge number of small, independent coffee shops and more seem to pop up almost monthly. Imagine spending every morning at a different shop performing your own “taste test” for the best coffee and pastry. Real estate prices in Laureles tend to be about 25% lower than many parts of El Poblado. Laureles has more two- or three-story older homes and a lower skyline than in El Poblado, although there are some mid-rise towers. Situated on a quiet street, just one block from Nutibara Avenue is a three-bedroom, two-bathroom, 1,570-square-foot apartment just waiting for you to call home. Prepare meals for friends in the integrated kitchen or relax on the balcony in a wicker chaise knowing you only spent $150,000 for this delightful home.